1. BREAKING IN YOUR PIPE As with good shoes, pipes need to be broken in: Your 10-15 first pipes smoked should be gradually filled with 1/3 to 2/3 of the full tobacco level. Smoke your pipes to the bottom each time. Thus a protective carbon layer is formed from the bottom up preventing burning of your briar pipe wood. Note that these first pipes produces a warmer smoke with a sharper taste, but it should not "bite" your tongue - the primary "turn-off" of new pipe smokers. Correct filling ensures your pipe does not unlit. Fill your tobacco looser in the bottom and harder towards the top. Humid tobacco should be filled looser than drier tobacco. Please practice filling. Too loose, and the light goes out. Too hard, and you get a pipe hard to smoke that often becomes moist. While smoking, you need to stuff the tobacco with the pipetool once in a while to ensure a good flame. 3. LIGHTING Use matches or a gas lighter for lighting. Ensure the lighting of your entire tobacco surface while you gently smoke it. Some prefer to let the initial light die out before "tightening" and relighting. Find your own preferred way. 4. SMOKING Pipes are smoked in a calmer manner than cigarettes. This ensures a cooler, tastier smoke. Initially you might experience a smoke too hot for comfort. A thin line of smoke emerging from your pipe is the tell-tell-sign of a calm smoker. Inhalation is not necessary in order to enjoy the taste. From time to time, the smoke channel must be opened by a pipetool. Dry off with paper. The ues of pipe cleaners: Move from the clean towards the dirty end of the mouthpiece. Use paper to remove the pipe cleaner. Clean the smoke channel in the pipehead as well. Good caretaking influences the taste. I use paper napkins and pipe cleaners. From time to time the carbon layer needs to be trimmed with a special pipe knife or a profiler. I prefer a layer of about 1 mm in thickness. Ensure a uniform layer and avoid pointed knives as they easily damage your pipe. 7. REST Pipes benefit from breaks for cooling and drying. Having several pipes to alternate between is a simple way of ensuring this. My favorite tobaccos include several brands made from pure virginia blends. I prefer the taste of tobacco to the aromatic and spiced varieties. In any case, I believe it is a good idea to start with "pure" tobaccos. Then it is up to you to explore. Tryt for example yellow Capstain, Erinmore mixture, My Own Blend no.100 or no.222, Mac Barens Virginia Flake or Mac Barens no.1. 9. 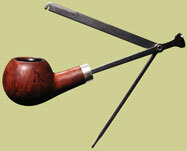 CHOOSE YOUR PIPE For most people, the design is the main criteria when purchasing a pipe. For technical reasons, I stay away from the cheapest pipes. These pipes do not always have the adequate properties. One of these you can visually check for yourself: Make sure the smoke channel is aligned with the bottom of the tobacco hole. If too high, your pipe becomes acidy. Also ensure that the mouthpiece is properly fitted to the pipe head. I normally hold my pipe with my fingers rather than holding it with my teeth. If you do not use your fingers, you should consider the weight of your pipe. 10. ETIQUETTE I prefer to believe that pipe smokers care as much for our fellow beings as for our pipes. Smoking is a matter of personal choice and I like to make sure that it stays that way for my surroundings.